This painting is a painting technique that I have been developing over the last 6-9 months. It is a style I call “Abstract Landscape”. It is about breaking down the effect of light, usually sunlight, on colour into ‘component’ pieces of colour. 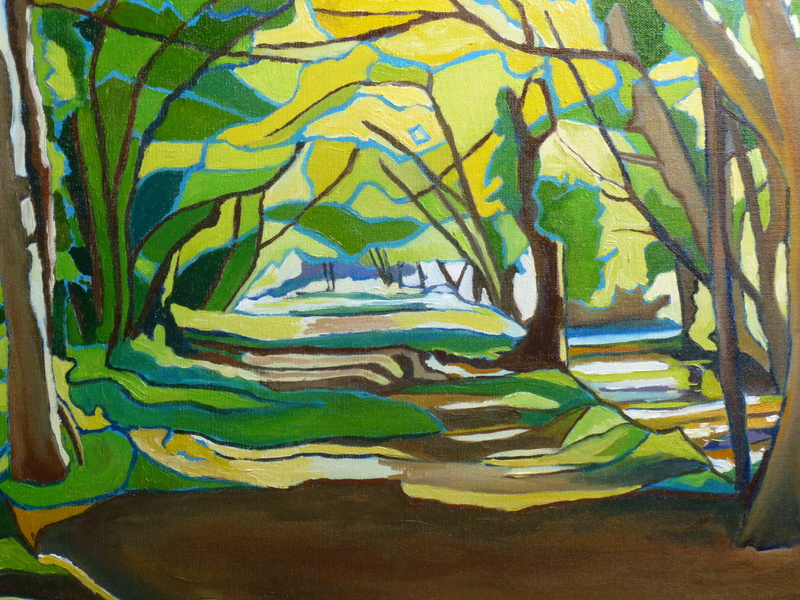 For example in this painting “Fractured Light” which is essentially sunlight spilling through a woodland grove, the yellow or lime green leaves represent the light peeping through the top leaves of the various trees and the blue light suggest sky-hued light around edges of leaves as well as illustrating light falling in the distance, providing a depth of perception in the painting. It is a very difficult, time consuming technique at times. First one has to find a suitable photographed image and then this image has to be deconstructed into combined segements of colour and light. The style is also difficult and sore on my brain as it is almost as if I am painting a pre-perception stage of vision itself. By this I mean, that it is similar to the pre-construction phase that is said to occur when we actually construct perception, as perception is constructed not an automatic process. So in looking at this painting our brain can both enjoy the painting and also ‘construct’ our woodland groves in our own minds. It would be interesting if we could tell if all the images we construct are similar or are all differentially marked by our own perceptions and experiences.